It is my view that music expresses emotion; that’s what music does well. It doesn’t express academic or intellectual concepts – you can try and illustrate them in figurative ways, but music expresses emotion. The moment that music sprang into my mind was when I started to hear emotion in the voice. And there’s a lot of emotion in the voice of the scientists because this is such a deep concern for them; they’ve dedicated their lives to this – to try to stem this radical change in our environment. Lynchpin offers a space where scientists articulate their science to communicators working in a different genre – an experiment of a different kind. Download the digital CD Booklet: with notes from composer Matthew Dewey about the work and an overview of the science that inspired him. Please explore the science narrative that inspired the symphony. Read for yourself about the vitally important physics and chemistry of the ocean on which we all depend and which scientists, of the Southern Ocean in particular, faithfully gather to inform decisions about our future. Full references provided. About 90% of the extra heat that’s been stored by the Earth’s systems in the last 50 years is in the Ocean. When we talk about global warming we’re really talking about ocean warming. Of the carbon emitted by the burning of fossil fuels, about 50% remains in the atmosphere; 20% is absorbed by the biosphere (all living things) and 30% by the Ocean, leading to acidification. Off Track, Saturday 31 October 2015 10:30AM, Australian Broadcasting Corporation (ABC), Radio National. COAL and CAPE FAREWELL – the two European partners behind ARTCOP21 – have mobilised artists and the wider cultural sector, to create a festival and cultural symposium during the Cop21 conference – the 21st United Nations Conference on climate change, Paris. From 30th November until 10th December 2015, they have created an exceptional cultural-climate festival in the city of Paris and a global on-line arts response in support of the COP21 proceedings. Lynchpin stands with and commends the organisers’ determination to continue as planned in the light of last week’s events in Paris. We are pleased to announce that from 18 November 2015, ex Oceano is part (click here) of the on-line global community through the ARTCOP21 initiative. ARTCOP21 has landed: 380+ Events, 40+ Countries: Climate is everyone’s business. The world’s ocean provides something extraordinary, on a scale almost beyond the mind’s grasp – an interaction between ocean, atmosphere and land that supports all life. This is a narrative on a grand scale, reminding us we are dependent on vast, sustaining planetary systems. ex Oceano is a creative venture in sound – a collaborative expression between disciplines and understandings. Ocean researchers expressed their science to a composer. The composer expressed that science back to them in sound – in the making of a symphony – a way to generate a different experience of ocean science and promote understanding of the role of the ocean in supporting life. Australian Composer, Matthew Dewey, worked with PhD candidates, Nick Roden and Rob Johnston, from the Institute of Marine and Antarctic Studies, University of Tasmania, Australia. 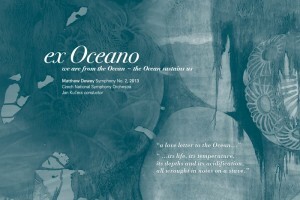 ex Oceano, the second symphony of Matthew Dewey, was recorded by the Czech National Symphony Orchestra (CNSO) in the Rudolfinum’s Dvořák Hall, Prague, 24-27 September, 2013. The Dvořák Hall is one of the oldest concert halls in Europe and is noted for its excellent acoustics. 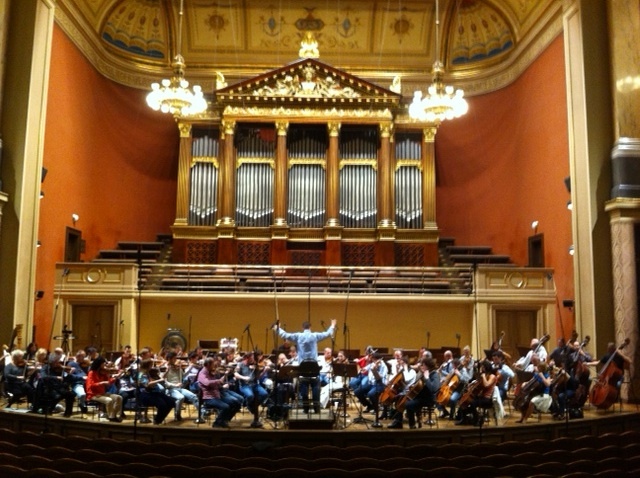 On 4 January 1896 Antonín Dvořák himself conducted the Czech Philharmonic in the first concert in this magnificent venue. A truly epic journey in creative ability and expressive powers took Matthew Dewey across the globe for this powerful and moving interpretation, as maestro Jan Kučera and musicians of the CNSO translate the notes of a musical score into a vast sonic immersion and experience – an extraordinary fusion in which compositional vision is brought to life and ex Oceano becomes a reality. Scientist, Nick Roden – loaded with film equipment – was on hand to capture footage of this truly momentous time for all involved in the collaboration. 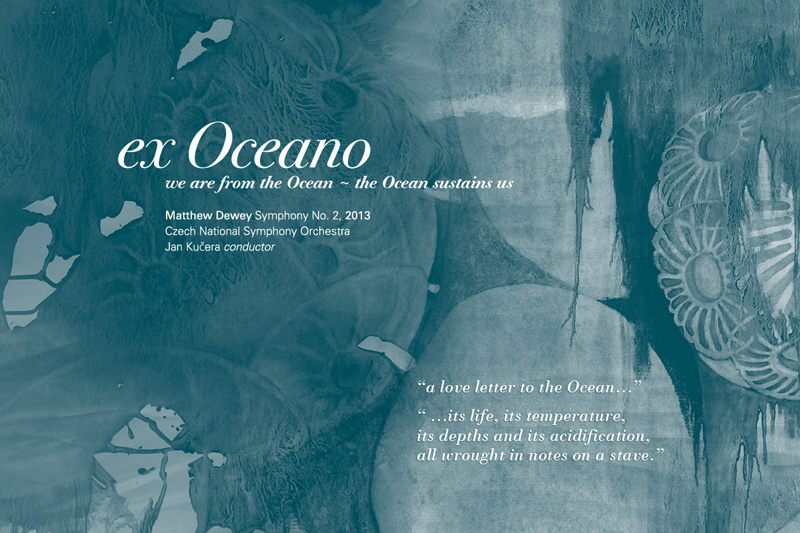 Composer Matthew Dewey has crafted a sensitive and powerful work, reflecting the deep significance of the ocean to all life. One of the outcomes of the collaborative process has been that the scientists who generated the narrative that informed the composer, then experienced their knowledge differently. In ‘hearing’ it they stepped both inside and outside that science. Ross Gibson, Sydney College of the Arts, in his paper The Known World, posits that ‘an artist makes a fulfilling conjunction and causes a turn in matter, time, space or events’. Matthew has generated such a conjunction; an immersive experience that embodies knowledge; a work with the potential to move and transform. We thank him for the generosity, creativity and expertise he has brought to this dialogue across disciplines. The process has been an adventure and a privilege. It is important to acknowledge the goodwill and interest of young scientists who have taken part in Lynchpin projects. Their willingness to share their science and their patience in translating that science into narratives – from the necessarily precise to a faithful overview that could inform a creative response – is greatly appreciated. In this collaboration, Rob Johnson for many hours generating the science narrative, editing and fine tuning. Nick Roden for filming the recording of ex Oceano in Prague, for the promotional video clip and for making available spectacular Southern Ocean and Antarctic footage to the project. As part of the visual arts response to the project, sincere thanks to Tasmania artist Michaye Boulter for generously allowing the use of her works and to Jenny Manners of Sarah Owen Designs who skilfully worked these with images by Sue Anderson, to create our CD and header designs; to Sarah Owen for expertise and collaboration in bringing the CD booklet and design to fruition; and to Lisa Roberts, Living Data program leader at University of Technology, Sydney for support and shared visions. Read more about the project under the subheadings on the ex Oceano menu. The main event today is not seen by those of us who live in it. Reference: (1) Leonard Bernstein; (2) Romanyshyn, Robert D., Ways of the Heart: Essays Toward an Imaginal Psychology, Trivium, Pittsburgh, 2002, p129.